An HO scale CNJ gondola on Steve Salotti’s model railroad. Seeing this at an operating session reminds me of one I’ve built and not painted yet. We all experience ebbs and flows in our hobby activities. We can make furious progress on several tasks over the course of a few weeks then two months may slip by with hardly any activity. Tasks from beyond our hobby world can dominate the spare time, especially with spring weather blowing away the grit and cold of winter. I’ve been working on several different tasks, but few are far enough along or very photogenic to share here. The death of a friend has also weighed heavily on my mind. Less busy days are coming back around for the hobby tasks and I hope to share updates soon. Let’s recap a few model railroad events from the last couple of months. Click on any image here to review a larger version. An HO scale PRR F22 flat car at Jim Dalberg’s home. At the end of March, I attended the 2014 Railroad Prototype Modeler Valley Forge meet and had a great time with many friends and modelers. The meet had 56 different presentations scheulded over a couple of days and 15 vendors selling a variety of parts and kits. A few home layouts were open for operating sessions on Thursday evening and Friday morning. Several layouts were open for visits on Sunday afternoon as the event closed out. Some images of the meet can be found on the RPM-Valley Forge website. I operated on the layouts of Steve Salotti and Jim Dalberg, where I snapped the two freight car images seen above. Additional images were posted to the Model Railroad Hobbyist forum. I gave a presentation on my B&O Wheeling Freight Terminal layout, blending prototype detail with documentation on the layout build. Before the meet, I was stalled on a simple mechanical design for the track switch controls. I received several suggestions at the RPM meet and returned home ready to try a few new ideas. Success remained elusive after attempting a few ideas and variations on those ideas. I wondered how Thomas Edison survived daily failures when working to invent the light bulb. My friend Mike from Las Cruces came by one day to survey the situation. After some discussion and review, we tried a slightly different method and it worked! Mike and I installed mechanical controls that day. Momentary contact micro SPDT switches to change the frog polarity were installed over the following few days. I now had the freight house portion of the layout working the way I had dreamed. Here’s what the front of the layout looks like with the controls installed. The first working ground throws installed on the home layout. 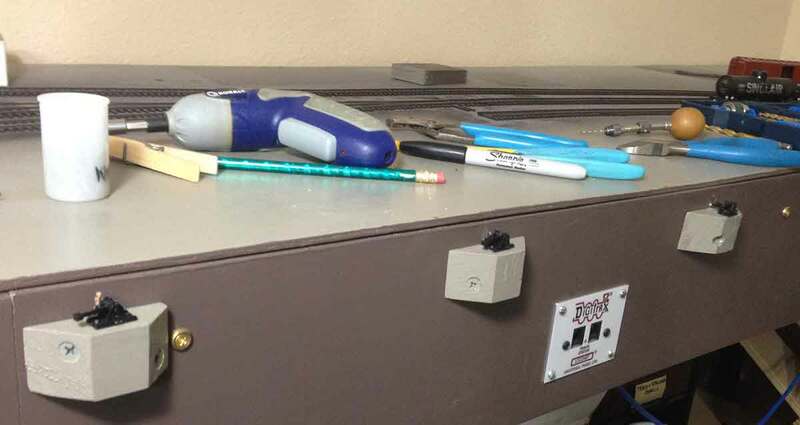 These operated track switches just beyond the line of tools. The rails are 50 inches off of the floor and the layout sections are two feet wide. I set design parameters on the track switch controls, similar to parameters set for the layout build. I had quite a few Caboose Industries ground throws on hand and they fit onto a 1×2 ledge attached to the fascia. Other materials include some steel wire, sweat equity, small screws and tacks, Velcro, dowel material for the longer reaches, and a vinyl corner material used with wallboard were used to create the track swtich controls. Eleven of twenty are now installed and working properly. These controls are influenced by Trevor Marshall’s S scale Port Rowan layout build. With the track switch control installations rolling along, I need to return to a resin box car kit and complete the work. The most difficult parts are installed so it is time to wrap up the other 40% of this build. Plus I have committed to build a different kit with a group very soon, so this must be completed! The underframe of an HO scale Yarmouth Model Works resin box car kit representing a Northern Pacific prototype. It feels good to return to action here on the blog. With the layout nearing the operation phase, there is much to do in the next couple of months. Check back soon for more! Your questions and comments can be posted below. All comments are reviewed and approved before they appear. As an FYI the CNJ GMb and GMd were most likely black and not the boxcar red F&C states in the instructions. There is a photo of one in the Krause and Crist book on the Susquehanna, page 92. Thanks Drew! I have a couple of those F&C gondola kits built but not yet painted. I was leaning towards black as it was. By the late 1940’s those CNJ gons were definitely red. Color photos in Morning Sun CNJ books from immediately after WWII show the color. War emergency gons, OTOH, and steel gons were black.